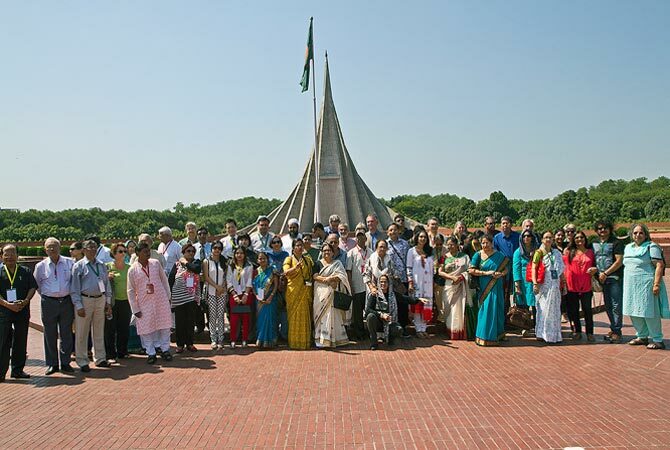 Rinki Roy Bhattacharya, journalist and writer, speaks of her experiences on being honoured by Bangladesh for her help during the 1971 liberation war. The news that Bangladesh was bestowing an honour to me came as a bolt from the blue! Why me? I wondered. And I was in disbelief until I got on to the early morning flight to Dhaka on December 12, 2012 along with many familiar faces from the Indian movie and media. I was feted along with over 60 veterans from other walks of life from countries as far away as the US, Japan, Turkey, Egypt. Most of these awards were posthumously received. It was the second, in cases, the third generation who stepped into the shoes of their ancestors, Hemant Kumar's son and Ritwick Ghatak’s daughter, for example. Some, like me, were the actual awardees. All of us had supported the 1971 liberation war in our own small ways -- I as a journalist and critic. Interestingly, a protest letter by me, happened to ban a trashy film by I S Johar, titled Joi Bangladesh. However, while I was in Dhaka to receive my honour in the hands of the Bangladesh Prime Minister Sheikh Hasina I remember mentioning that my uncle, late Benoy Roy was the first Indian civilian to enter liberated Bangladesh in March 1971. Escorted by the Indian army, his coverage of that historic moment gave the first graphic images. Splashed in cinema halls across India, the newsreel images he painted with his camera -- like the stills of late photographer Kishore Parekh -- had opened the world’s eyes to the horrors of the 1971 war. Images that haunt us till date -- and have become iconic symbols of the 1971 War. Parekh’s book, Bangladesh, a brutal birth bore a signature unlike my uncle’s newsreel footage. No one knew that a man called Benoy Roy had shot the first footage of the war that ravaged Bangladesh until I pointed this out. Little did I realise that my observations about this unknown man will be recorded and so I returned again to collect the friends of liberation war honour for my uncle Benoy Roy on October 1, 2013. Receiving honours at this ceremony were several familiar faces. Two yesteryear movie veterans topped the list -- Biswajit and Waheeda Rehman, the star pair who thrilled audiences in Bees Saal Baad and Kohra. During the 1971 war, Waheeda along with Pran, and Shammi formed the Bangladesh Sahayak Samiti of Maharashtra, collecting funds with their cultural troupes. The cultural group included Sunil Dutt, Nargis, Lata Mangeshkar and Kalyanji Anandji and many others. Last year, when Anandji was honoured, he reminded us that women attending music concerts in aid of Bangladesh would smilingly remove their gold ornaments as donation! This included the late Sumati Morarjee! Incredible, I thought. The august ceremony held in the mammoth Bangabandhu International Centre in the late October afternoon was poignant to say the least. We were often moved to tears as senior citizens, many on wheelchairs received mementos 41 years late for their generous support to the war that left 3 million dead, disabled or untraced. Foreign Minister Dipu Moni publicly shed tears when the granddaughter of Lt General Iwaichi Fujiwara’s pretty granddaughter sang a popular Bangla song recalling her grandfather whose timely help brought succour to Japan’s local Bangladeshis. Amongst those honoured at the ceremony was the noted documentary maker Sukhdev whose renowned work Nine Days to Freedom was a scathing criticism of Pakistan. The others included the Late Fakhruddin Ali Ahmed, Gulzarilal Nanda, V K Krishna Menon, Turkish journalist Cetin Ozbayrak, painter Somnath Hore, physician Jainal Abedin, social worker Asgar Ali Engineer, singer Suchitra Mitra, Kishore Parekh, Ambassador Samar Sen, social workers Paul and Ellen Connet. The last two, a sprightly couple in their late seventies, had organised UK-based Bangladeshis to form a group called Action Bangladesh garnering wide media attention. Many worked as cooks (they still do) in so called Indian restaurants -- they struck work against the massacre of unarmed Bengalis by the ruthless Pakistani army. The ceremony also recognised the gallant contribution of Pakistani politician Abdul Wali Khan, known as the Frontier Gandhi and Professor Tariq Rahman who bravely raised their voice against the genocide in former East Pakistan. In her eloquently worded speech, Haseena, acknowledged her country’s gratitude to India at that grim stage of history when men, women, children, laid down their lives to create a new nation we know and salute as Bangladesh. Joi Bangla. Jai Hind. The twain shall be friends forever! Rinki Roy Bhattacharya is a writer and journalist and chairperson of the Bimal Roy Memorial and Film Society.